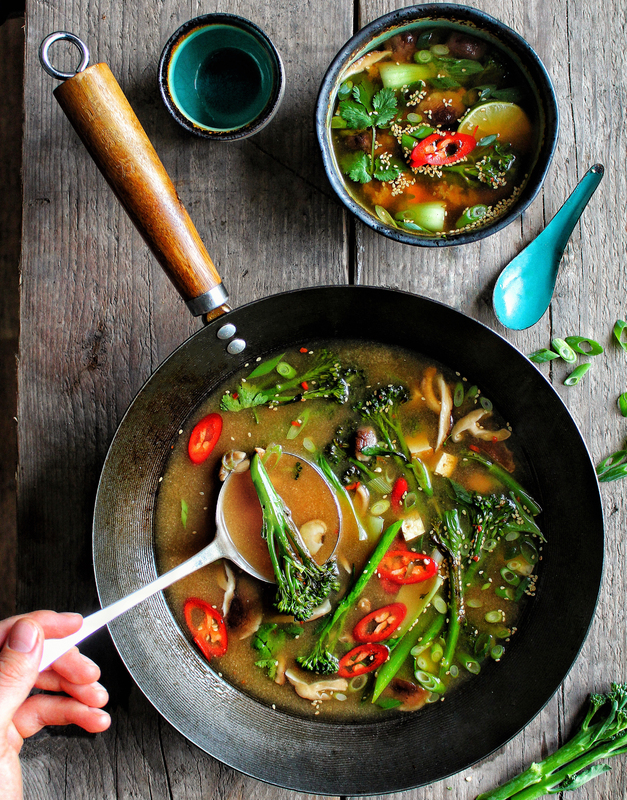 This broth is the perfect side dish to accompany any asian inspired dish, its packed full of punchy flavours & filled with slightly charred Tenderstem® . You can even turn this side into a main by adding rice noodles. 4 cups/1ltr Vegetable Stock, Hot. Pre heat a griddle pan over a high heat, add a touch of oil then grill the Tenderstem® until charred – this should take around 2 minutes. Then remove from the pan. Pre heat a large wok or saucepan over a high heat. Add the sesame oil. Wait for the pan to get super hot. When the pan is almost smoking throw in the ginger & chilli. Sauté for 1 minute before adding the Tofu and Shiitake mushrooms. Turn the heat down low and add the vegetable stock, soy sauce, miso, vinegar and maple. Let the soup simmer away for 5 minutes. Meanwhile, slice the spring onions thin on angle. Just before removing the saucepan or wok from the heat throw in the pak choi & grilled Tenderstem® . Once its slightly wilted remove the pan from the heat. Serve the soup straight away, topped with spring onion, chilli & a sprinkle of mixed sesame seeds.